As a pharmacist, details matter. So join the pharmacists who dive the deepest when it comes to caring for communities. Get your Pharm.D. in the health care capital of America. Build the knowledge you need to be a pharmacist and gain the versatility you need to advance your career. We've designed curriculum that will guide you through your most challenging and rewarding experience yet: a pharmacy degree. Our high first-time NAPLEX pass rate is evidence — No. 18 in the U.S. and No. 1 in Tennessee for the class of 2017. Prepare yourself to join one of the fastest-growing industries in the nation. Let our expert faculty share their clinical knowledge embodied with Christian values. We promise: you’ll never be a number. You’ll be a member of a community who knows you by name. And with our 100 percent job placement rate, we're confident that when you've earned your degree, you'll have a career to go with it. You also have the opportunity to maximize your time, money and effort when you choose one of our dual degree programs. Gain a greater understanding of other health care providers with interprofessional learning. Choose from experiential practice locations of the highest quality and variety. 14 Introductory Pharmacy Practice Experiences in three five week blocks in years P1-P3. Interprofessional learning with health professionals across the College of Pharmacy and Health Sciences. Dual degree options in Health Care Informatics or Master of Management in Health Care are available. Lipscomb University College of Pharmacy is accredited by the Accreditation Council for Pharmacy Education (ACPE). The college has demonstrated to the satisfaction of ACPE that the program complies with accreditation standards, including the appropriateness of the program’s mission and goals, the adequacy of resources and organization to meet the mission and goals, outcomes which indicate that the mission and goals are being met, and the reasonable assurance of the continued compliance with standards. Lipscomb University College of Pharmacy has fulfilled the accreditation requirements set forth by ACPE for the Professional Degree Program in Pharmacy and is granted accreditation status through June 30, 2026. 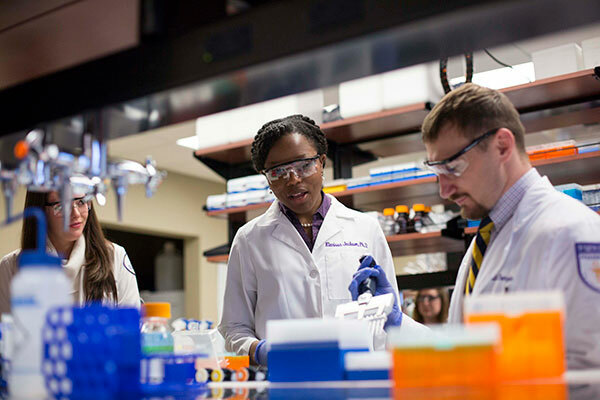 Lipscomb University College of Pharmacy currently has a 100 percent job placement rate, 95.83 percent NAPLEX pass rate, and 78.7 percent residency placement rate. The College of Pharmacy utilizes a rolling admissions process and a holistic application review to identify appropriate candidates for interviews and potential enrollment. The application opens in mid-July each year for enrollment in August of the following year. Application reviews and interviews are ongoing throughout the fall and spring semesters or until the class is full. Applicants are encouraged to apply early! Many factors are considered in the holistic review of the application, interview, and admissions process. They may include the following: academics, communication skills, letters of recommendation, problem solving skills, professionalism, work experience, degree earned, research, volunteerism, interview performance, attitude, timeliness, and other factors that help differentiate those applicants that possess the highest likelihood of succeeding as part of the health care team. Certain exceptions may be granted on an individual basis concerning admission requirements. No assurances or guarantees are given or implied based on the completion of the prerequisites or achieving a high level of academic performance. Achievement of a grade of "C" or higher for each required pre-pharmacy course is mandatory. You must also attain a cumulative academic grade point average (GPA) of at least 2.5 for all coursework. Substitutions may be offered for specific prerequisites outside of the math and science core curriculum to those having bachelor’s degrees through an appeal process. You may submit an application while prerequisites are in progress and begin preparing for an on-site interview. Do you have all the courses? The pre-pharmacy education will require a minimum of 64 semester hours. Required pre-pharmacy courses should be completed by the end of the spring semester prior to desired enrollment; however, coursework may be in progress or planned at the time of application without it negatively impacting the application. If an applicant has not completed all required pre-pharmacy coursework prior to submitting the application, a proposed plan for completion is required as part of the application process. CLEP/Advanced Placement Credit - Advanced Placement (AP) and CLEP credit (credit by examination) may be used to satisfy prerequisite coursework provided that the credit is accepted by the applicant's institution and is posted on the applicant's official academic transcript. Acceptance of credit is at the discretion of Lipscomb University College of Pharmacy based upon course equivalency standards. Does your GPA meet the requirement? Achievement of a grade of "C" or higher for each required pre-pharmacy course is mandatory. You must also attain a cumulative academic grade point average (GPA) of not less than 2.5 on a 4.0 scale for all coursework. The PCAT is NOT required for admission at Lipscomb. If you would like to include PCAT scores optionally, remember to include your CID Number on your PharmCAS Application so your scores may be matched to your application. After the test date you may request additional scores by visiting www.pcatweb.info. Applications are available through PharmCAS. Applications must be completed and submitted electronically via their website. Please read instructions very carefully to be sure the application is submitted properly. The 2018-2019 deadline for submitting applications is June 3, 2019. An on-site interview is required for admission to Lipscomb University College of Pharmacy. Interviews are conducted by invitation only. Each complete application will be evaluated for competitiveness. Review the Technical Standards necessary for the completion of our program. Students who enroll through the Early Decision process have distinct advantages. In addition to eliminating the waiting game of your admissions decision, you also qualify for early scholarship consideration. Early Decision students are the first students evaluated by the scholarship awards committee for a variety of Dean's Scholarship awards ranging from $500 to $5,000. Additionally, the Provost Pharmacy Scholar award is specifically designated for students who apply by September 1. Any student not admitted through Early Decision will automatically have their application rolled forward for consideration in the regular admissions process. The deadline for submitting an application with an Early Decision designation is in early September each year. Student pharmacists requesting a transfer to Lipscomb University College of Pharmacy from another Doctor of Pharmacy program must follow College guidelines. Each case will be individually assessed on its merit and potential transfer students are to be informed that it is likely that an additional semester or more is needed to fulfill all required coursework. Student pharmacists must have an official transcript of their work from each school they have attended mailed to the College of Pharmacy's Director of Admissions and Recruitment office. Transfer candidates will be evaluated for transfer eligibility based on previous academic performance, personal behavior, on-campus interview, and, when applicable, recommendations from faculty from the previous college/school of pharmacy. A grade of "C" or better must have been earned for each course for transfer. At least 50 percent of the credit hours required for the Doctor of Pharmacy degree must be earned in coursework at Lipscomb University College of Pharmacy; therefore, only transfer candidates in the earliest semesters of their respective pharmacy programs are eligible for transfer. Credit must have been received from an Accreditation Council for Pharmacy Education (ACPE) approved college of pharmacy before it will be awarded. Additionally, the prospective transfer student pharmacist must complete an onsite interview process arranged by the Director of Admissions and Recruitment. Transfer student pharmacists may also be asked to complete an assessment consistent with the level of coursework the student pharmacist should have completed prior to transfer. An assessment will be made on the score received to ascertain if the transfer should move forward and what academic level within the College. Additionally, all applicants to Lipscomb University College of Pharmacy must possess a cumulative grade point average (GPA) of 2.5 on a 4.0 scale on all previous college work. Grades from all undergraduate coursework attempted are included in the calculation of the overall undergraduate GPA which is the primary GPA used in the admissions process. All previous academic work will be evaluated. If you are interested in transferring and meet these criteria, request the application through the Student Affairs Office - pharmacy@lipscomb.edu. An applicant who is not a United States citizen or permanent resident must follow the same admissions procedures as applicants who are U.S. citizens (see Admission Requirements) in addition to the following specific requirements. There will be no exceptions to this policy. The following items are required prior to submitting an application. Prospective applicants must have been enrolled at an accredited U.S. college or university for a minimum of two years prior to the planned enrollment date. All academic records from colleges and universities located outside the United States. Official transcript(s) must be in the original language and a translation in English. A course-by-course report from the transcript evaluation service World Education Services (WES) must accompany the transcript. Contact information for WES can be found at the website www.wes.org. Evaluations from other services are not accepted. The outside assessments by WES are subject to review and approval by the Office of Student Affairs. This includes, but is not limited to, decisions regarding acceptable credit, prerequisite fulfillment, GPA calculations, degree equivalencies, minimum passing grade levels, etc. The college is not obligated to accept the conclusion of any outside evaluation service. Official transcripts should be submitted directly to Lipscomb University College of Pharmacy. English courses taken outside of the United States will not be accepted toward meeting the English requirements unless English is the official language of the university or college attended and all instruction (except for foreign language courses) is conducted in English. International students are required to be proficient in written and oral English before submitting an application. Applicants whose native language is not English must present the results of the Test of English as a Foreign Language (TOEFL), prior to applying for admission to the college. For more information, visit www.toefl.org. Minimum TOEFL scores are 213 for the computer exam and 550 for the paper exam. The equivalent TOEFL iBT score is 80. Lipscomb’s TOEFL code is 1161. In addition to an acceptable score on the TOEFL, other evidence of proficiency in English may include letters from employers or instructors, credit earned in English language courses and a personal interview. After all of the required documents are received, the Office of Student Affairs will evaluate whether the coursework can be applied to the prerequisite requirements for admission. If all prerequisite requirements will be met by the spring semester prior to the anticipated enrollment and all other documentation has been submitted and approved, then a formal application may then be submitted to the College. Applicants must provide copies of current status with the U.S. Immigration and Naturalization Service (INS) at the time of application., i.e. VISA, I-94 and I-20 documents. Applicants must provide financial statements requested from their U.S. banking institution that shows adequate funds needed for all expenses for at least one year related to enrollment in the Lipscomb University College of Pharmacy. The primary mission of the Lipscomb University College of Pharmacy is to provide an educational environment characterized by academic excellence and Christian faith, where student pharmacists are prepared to optimize patient medication outcomes in an ethical and compassionate practice. The professional program leading to the Doctor of Pharmacy (Pharm.D.) degree and eligibility for licensure requires a certain level of cognitive , behavioral and technical skill and ability inherent in a professional education. These principles and standards hold for admission, progression and completion of the program. The primary role of the pharmacist is to provide safe and effective healthcare to the patients served. Patient safety must be considered in the selection and education of student pharmacists. As well, the College of Pharmacy has a responsibility to maintain as safe an environment as possible for its student pharmacists and the practice settings in which they receive education. Student pharmacists must reasonably contribute to a safe environment through their personal, physical and mental health or social behavior. All student pharmacists are expected to successfully fulfill the same core educational requirements. Reasonable education-related accommodations will be provided, where possible and within Lipscomb University guidelines. Student pharmacists need to possess the skills and abilities with or without accommodations that will allow successful fulfillment of the requirements necessary to complete the program. Student pharmacists who graduate from the program are eligible to become pharmacists without restriction on their practice; therefore, the curriculum requires student pharmacists to successfully complete all core components of the program and does not allow student pharmacists to take part in a limited set of required activities. Lipscomb University College of Pharmacy will consider for admission any candidate who demonstrates the ability to perform or learn to perform the skills listed in this document. Candidates are not required to disclose the nature of their disabilities, if any, to the Admissions Committee. Any candidate who has questions about the ability to satisfy these technical standards is strongly encouraged to discuss the issue with the College of Pharmacy's Director of Admissions and Student Affairs prior to the application or interview process in order to determine whether or not reasonable accommodations can be made. Certain chronic or recurrent illnesses and problems that interfere with patient care, safety or required class attendance may be incompatible with pharmacy training or practice. Other conditions that may lead to a high likelihood of student illness should be carefully considered. Candidates must, at all times, demonstrate the emotional stability to be able to exercise sound judgment, and carry out prompt completion of all of the responsibilities attendant to the care of their patients in a sensitive and effective manner. Deficiencies in knowledge base, judgment, integrity, character or professional attitude or demeanor, which may jeopardize patient care, may be grounds for course/rotation failure and possible dismissal. Therefore reassessment of individual's ability to meet the technical standards will be an ongoing process through the duration of the program. Lipscomb University College of Pharmacy adheres to technical standards by which it assesses all students, with or without accommodation. A candidate must meet all criteria noted regarding the five following areas: 1) observation; 2) sensory and motor coordination; 3) communication; 4) cognitive ability and 5) behavioral and social attributes. Failure to meet all components in each of the five areas may result in a student's dismissal. Each case will be reviewed on an individual basis by the appropriate College personnel. The following technical standards describe the essential functions students must possess and demonstrate in order to fulfill the requirements of a general pharmacy education, and thus, are prerequisites for entrance, continuation and graduation. The College of Pharmacy is committed to student diversity and individual rights, with a strong commitment to full compliance with state and federal laws and regulations including Section 504 of the Rehabilitation Act of 1973 and the Americans with Disabilities Act of 1990. Candidates with disabilities are reviewed individually, with complete and careful consideration of all the skills, attitudes, and attributes to determine whether there are any reasonable accommodations or available options that would permit the candidate to satisfy the standards. An accommodation is not reasonable if it poses a direct threat to the health or safety of self and/or others, if making it requires a fundamental altercation to the nature of the program, if it lowers academic standards, or poses an undue administrative or financial burden. Except in rare circumstance, the use by the candidate of a third party (e.g., an intermediary) to perform any of the functions described in the Technical Standards set forth above would constitute an unacceptable substantial modification. Student pharmacists who desire disability services or accommodations should make their request known through the College of Pharmacy's Office of Student Affairs. An appointment will be scheduled to discuss the needed services. The student pharmacist will be required to present appropriate documentation for the disability and information regarding any past accommodations provided that have been successful. Questions regarding the technical standards, the process for requesting accommodations or eligibility requirements may be directed to the College of Pharmacy's Director of Admissions and Student Affairs at any point prior to admission, during the admission process or after enrollment in the program. The appropriate college administrators will evaluate each request to determine eligibility for services. See courses listed under the Doctor of Pharmacy curriculum. Seven hours of the Doctor of Pharmacy curriculum are required courses, which apply toward the dual degree. Since these are required courses the costs are covered by the College of Pharmacy tuition. MITM 5213 has prerequisites, which include a course in Statistics and also MITM 5023 - Data and Knowledge Management (3). Each student must apply for and be accepted into the College of Business. PHPR 3nnV is to be taken as a 2-hour elective. Tuition rates published reflect first-year tuition charges. Students who complete FAFSA (Free Application for Federal Student Aid) may be eligible for direct federal Stafford loans and/or Graduate PLUS loans. All amounts shown are estimates and subject to change. Fees include: Insurance, Labs, Technology, Student Activity, etc. Newly accepted student pharmacists are considered for scholarships on the basis of the holistic PharmCAS application review and are awarded on a competitive basis. Students who meet and/or exceed the preferences of the admissions criteria will be considered for scholarship awards first. No additional application is required. Scholarships for returning students in the P2, P3, and P4 years are awarded through a separate application provided during the spring semester each year and made through a committee review process. Students desiring scholarship consideration are encouraged to apply early in the application cycle. Dean's Scholarship Award: For applicants applying by February 1. Amounts vary from $500-$5,000 based on the holistic application review and interview. Trustee Pharmacy Scholar: For applicants having at least a 3.75 GPA and an exceptional portfolio and exemplary interview. Provost Pharmacy Scholar: For applicants applying on or before September 1 with a 3.0 GPA and exemplary interview. Presidential Pharmacy Scholar: For Lipscomb undergraduate Trustee, Presidential, or Provost scholars pursuing 3+1 degree in Biology, Chemistry, or Health Sciences who have participated in the Pre-Pharmacy Society and have a 3.5 GPA and an exemplary interview. Pharmacy Tech to PharmD Scholar: For pharmacy technicians with 5+ years full-time work experience, recent prerequisite completion and an exemplary interview. Research Scholar: For applicants with published research in a relevant scientific field who intend to pursue research while in pharmacy school. Degreed Student Scholar: For applicants earning a bachelor's degree with at least a 3.5 GPA and an exemplary interview. Community College Scholar: For applicants progressing directly into the PharmD program from a community college earning an AA or AS degree. TN Pharmacy Access Scholar: For TN applicants who received the Hope Aspire award as an undergraduate student. Eligible to receive for five years from the original date of receiving the award as a freshman, so if you were awarded the HOPE as an undergraduate, you may no longer be eligible. For financial aid purposes, you are considered a professional student once you are accepted into the College of Pharmacy. This means that you will file as an independent student on your FAFSA, even if you are claimed as a dependent on your parent’s income taxes. You will not use any of your parents’ information when you file your FAFSA. Complete the FAFSA. We recommend that the FAFSA be filed electronically by April 1. Be sure to have your tax information from the most recent tax year and your driver’s license. If you do not have your tax return completed by then, go ahead and file the FAFSA. You can always amend your FAFSA once your return is complete. If you have filed a FAFSA before, you will need your FSA ID. If you have not filed a FAFSA before, request an FSA ID. Please be sure to answer the following questions on the FAFSA as shown. How to answer FAFSA Question 28: When you begin the school year, what will be your grade level? How to answer FAFSA question 29: When you begin the school year, what degree or certificate will you be working on? How to answer FAFSA question 48: At the beginning of the school year, will you be working on a master’s or doctorate program? We know that you want to be an innovator in the field. That’s why we offer unique research opportunities in our state-of-the-art facilities with our world-class faculty so that you can hone your expertise. Utilizes medication and clinical knowledge to ensure patients receive the most appropriate mediation therapy in a convenient and cost-effective way. Works directly with doctors, nurses and patients to make sure each patient receives the correct medication and dosage. They evaluate patient lab reports to offer consult for alternative medication options and work directly with patients to ensure they understand their medications while in the hospital and as they are discharged.